Vanessa Hudgens was spotted making a special appearance at the "Today" show in New York City this morning on January 23, 2014. 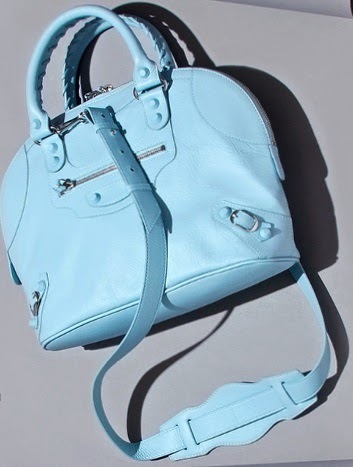 I love spotting older Balenciaga bags! This color (Cafe) and Brief style is nearly 7 years old and also has been discontinued. What's different about this bag is that is very spacious inside and is trapezoid shaped. It is strictly handheld since it does not have a shoulder strap but can be squeezed on the shoulder if needed. A similar color and style would be the classic Velo or Work in Cigare. Doutzen Kroes was spotted attending the Bjorn Borg Fashion Show in Amsterdam on January 22, 2014. The 28 year old looked very chic with her Balenciaga Leather Jacket and Celine Trio bag. Khloe Kardashian was spotted carrying Balenciaga's newest pink color from the spring season. Her Balenciaga G12 City is a pretty shade of powder pink! Kylie Jenner was spotted out to lunch with friends in Calabasas, CA on Thursday January 2, 2014. The reality star carries one of Balenciaga's newest styles from the holiday collection. Her bag is the Mini Bowling bag in Bleu Layette. The holiday collection features rubberized studs and smooth goatskin leather.